One example is hot oxy-combustion. The HOxyGas project aims to demonstrate a new type of production system for automotive flat glass that has a lower carbon footprint than comparable systems in terms of reduced fossil fuel consumption and reduced GHG emissions. 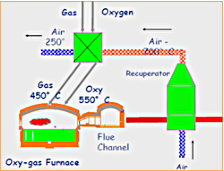 An innovative process is proposed to produce glass that uses only hot natural gas (450°C) and hot oxygen (550°C) . The glass production process is very energy intensive. Therefore, over the last years many different techniques have been developed to reduce energy consumption and GHG emissions.